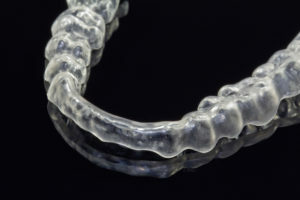 Occlusal Splints are sometimes referred to as ‘Nightguards’. An Occlusal Splint is a device, not unlike a mouthguard, that is worn at night to reduce the amount of grinding pressure transferred to the teeth. It offers relief for the muscles of the jaw and protection of the teeth from wear and breakage. People are often not aware of grinding or clenching their teeth, particularly at night. This grinding and clenching can lead to headaches and pain, particularly in the temples. At times patients do not experience any pain or discomfort, but find that do tend to chip or fracture their teeth very easily. Your dentist will be able to alert you to the fact that you are grinding and clenching because examination of your teeth reveals patterns of wear and tear on the chewing surfaces. Because fractures in teeth can sometimes only be repaired using a dental crown, an Occlusal Splint is an effective way of protecting your teeth from damage, and preventing the need of expensive dental procedures in the future. The process of making an Occlusal Splint is fairly straightforward. Your dentist will begin by using an impression paste to make models of your teeth. This model is passed on to our technicians who manufacture your custom splint. Your new Occlusal Splints may take a little getting used to and it is recommended that you do not to eat or drink while wearing it. Many patients find that within a few nights the Splint is completely comfortable to wear and find that conversation is possible.